I want my horse to ‘collect’ more. I want my horse to go ‘on the bit’. Two statements guaranteed to strike apprehension in coaches who regularly work with adult recreational riders! These requests are nearly always made genuinely, after all, we are trained by what we see in a dressage or show arena. Having a horse round is ‘good’ and therefore what we should all be aiming for. The desire to emulate what’s being seen in performance at an elite level is admirable. Unfortunately, what is often produced in response to this vision is rarely in the horses best interests. I see answers to these sorts of questions on social media and often shudder even more. The answers invariably are about how much pressure to put in your hands, using a different bit (usually a stronger one), lunging with things tied in a hundred places and I recently even saw a suggestion of using a war bridle! 90% of the answers are based on the horses response, not the riders aids or understanding of them. Social media being what it is, there’s always the person who suggests the person should seek assistance from someone more knowledgable than they are. Of course this is absolutely what the writer should do but it’s presented in such a condescending manner it makes it sound like an unattractive proposition. We are all aware of the training scale. The training scale focuses on the horse’s development. Where’s the training scale for riders? I often see riders without an independent seat and/or hands asking for work from a horse at a higher level than they’re at themselves. These are the riders wanting to work more on collection when they are not even achieving a coNNection! We need to be better riders, we all (and I certainly include myself here!) need to strive for that. We need to ride better so our horse can carry us with ease. We need to have an independent seat and hands so we can give subtle aids with one part of our body without it impacting on the rest of our body or give an unclear aid to our horse. Correct training takes time. It takes time for the muscles and the neural pathways created through that correct training to grow and consolidate. You can go down a quicker road to achieve, what can appear to be, the same results. At some point, the holes left in that basic training will appear. They’ll pop up when the work becomes more advanced or you don’t have the strength to hold the horse together. They’ll appear as injuries where the work has loaded a joint or a set of muscles incorrectly. Maybe not today and maybe not tomorrow but, they will appear. When I speak of correct training I mean for both horse and rider. We have the advantage of being able to read, watch demonstrations, question why a coach is asking us to do something specific, and to understand exactly why the training scale exists for the horses and to use it. If we’re serious about wanting to train our horse better we need to be serious about training ourselves better too. Our own skill, understanding and coordination takes just as much time to achieve as taking a horse through the levels! A forward and active connection is what we should all be striving for in the first instance. Note I refer to connection, not collection. Collection is first asked for at Elementary or Second Level dressage tests. The reason for this is easily explained by looking at the training scale. 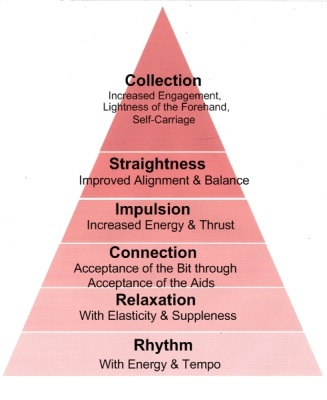 The first elements of the training scale are specifically about your horses rhythm, his tempo, his balance, his relaxation. This all relates to his legs and his body, not where his head is. Once you get that relaxation and rhythm you’re going to find it the easiest thing in the world to move to the next step, the connection and acceptance of the bit. A correct connection should feel like you’re catching his back legs in your fingers. All that wonderful energy’s flowing into your fingers and you’re simply recycling it back through your horse’s body. It should not feel like your arm is in a braced, you’re pulling on his mouth or he’s pulling on your arm and you feel like you’re sitting on a block of concrete which really isn’t going anywhere at all! True collection is a further tuning of that energy. The energy is still moving through the body it’s simply being distributed in a different way. All this talk of a connection being easy and feeling lovely is difficult to imagine when you’re still fighting to give clear aids and keep your hands still right? Perhaps the riders training scale should read something like: Coordination, independence of seat/hand, connection, independence of fine aids and all underpinned with an understanding of why we’re asking the horse to work the way we do regardless of the discipline we’re participating in. So, for the sake of your horse…let out the rein a notch or two, make sure you’ve a soft, forward, relaxed and balanced animal. Make sure you’re even in the saddle (ask someone to video you from the front and behind if you’re unsure) don’t worry about where their head is for a moment, and work on your own body awareness for a few weeks with a view to becoming more independent and being able to be clearer in your own aids. Ask a friend to lunge you if it’s safe to do so. Concentrate on you for a while, have some lessons just on you, not worrying too much about the horse. Take some yoga or pilates classes to increase your body awareness off the horse. Take a step back for a few weeks and work on you and see how quickly you and your horse move forward towards a better connection and happier riding all round!